H.E. Msgr. Bonazzi was born in Gazzaniga, in the province of Bergamo (Italy), on June 19, 1948 and was ordained a priest on June 30, 1973 for the diocese of Bergamo. He has a Doctorate in Educational Sciences from the Salesian Pontifical University (Rome), and a Licence in Theology and in Canon Law from the Lateran Pontifical University (Rome). Archbishop Bonazzi entered the diplomatic service of the Holy See, on March 25, 1980 and has served in the following countries: Cameroon, Trinidad and Tobago, Malta, Mozambique, Spain, United States of America, Italy and Canada. On June 19, 1999 he was appointed Apostolic Nuncio to Haiti, and on August 26, 1999 received the Episcopal Ordination in Bergamo (Italy) by Cardinal Angelo Sodano, Secretary of State. 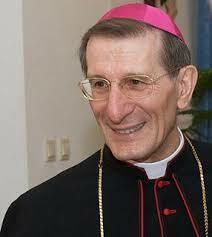 On March 30, 2004 he was nominated Apostolic Nuncio to Cuba. On March 14, 2009 he was nominated as Apostolic Nuncio to Lithuania and Estonia and on March 25, 2009 Apostolic Nuncio to Latvia. On December 18, 2013, he was appointed Apostolic Nuncio to Canada. He arrived in Canada on Februray 5, 2014 and presented the Letters of Credence on March 13, 2014. Besides his native Italian language, he speaks English, French and Spanish.